Nice news for the end of the week. A new network has come together on Facebook for Postwatch colleagues, in recognition of the friendships and contacts that have been made over the life of the organisation. Search for Postwatch friends and colleagues if you are a social networker. I once proposed a ‘feel tank’ to look at Britain through emotions rather than the think tanks that are ever so rational and empirical. I imagined holding it in a Gallery, perhaps with a Rothko on the wall. It has never happened… but perhaps it might one day. · Anxiety: The long-drawn out process of advertising for the Northern Ireland roles is a real concern and has been slow. · Pride: We have a High-Level Strategic Framework agreed and it is good! Allan (Asher) was simply wonderful for energywatch in front of the BERR select committee. Here is how the Times lauds our Allen. 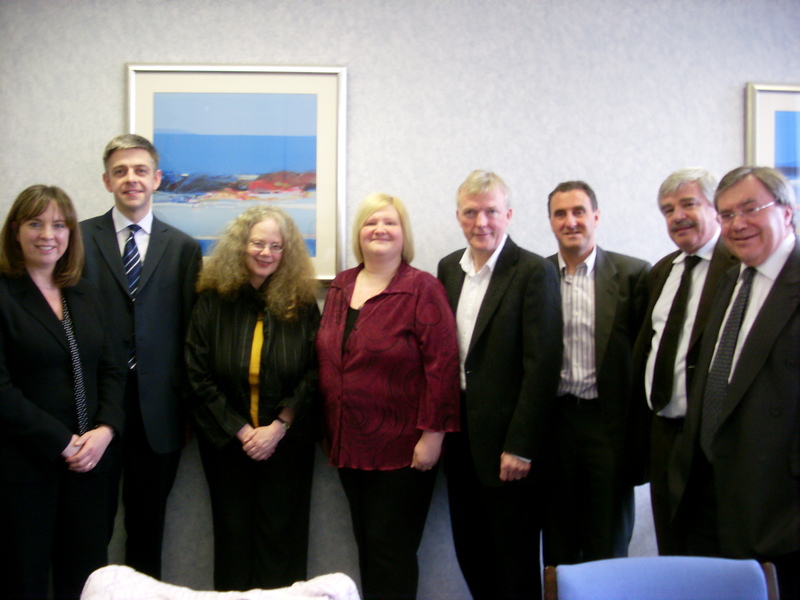 This is my photo of the first meeting of the new Scottish Consumer Council! Described by one of the Scottish papers as “the magnificent seven”, they are a wonderful team, full of ambition, empathy and experience, and I left Glasgow with a spring in my step. I am married to one and I am the son of one. What are they? Lawyers. In fact, my father in law is also an second hand car dealer and sister in law an estate agent. So, I grew up pretty much steeped in jokes about consumers being conned by my family professions. Well, the lawyers are out in force, as BERR launch a review on consumer law. And I spoke recently, along with the wonderful Monique, who is the new head of the European consumer alliance, BEUC, also a lawyer on digital rights. I am speaking on consumer rights in a digital age at the BERR and NCC Conference on Making Europe Work for Consumers today. I have studiously tried to avoid giving any speeches on any subjects other than presenting on the merger to colleagues, but the team at NCC know all my weak spots, so here I am. It is a straightforward subject in fact, because it is as simple as NCC’s Jill Johnstone once put it to me “They all want to tell consumers what they CAN’T do, but people want to know what we CAN do.” This is in many ways also the theme of a wonderful new book by Jonathan Zittrain, called the future of the internet – and how to stop it Jonathan has wisdom, warmth and better brains than any on internet stuff. His book is a great consumer call to action. I am speaking to Ann Fitzgerald at the National Consumer Agency in Ireland. I had wanted to make contact so that we could share and exchange information and work in future. She is working on construction at present and wants to move onto arbitration and redress. However, they are also going through an organisational change process of their own as they are moving offices from Dublin to Cork. Sounds like we will emerge fresh at around the same time!